Most of the functionalities provided by your Store are there because of certain modules being installed to the Store additionally. PrestaShop 1.6 is a complex php applications which is enabling you to extend it as much as you would like to thanks to its modules and in the next few lines of this tutorial we will show you how to fully manage the modules of your website. 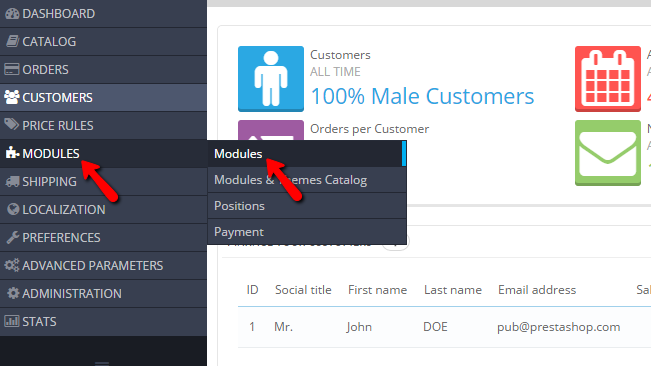 All of the modules for your Store are conveniently stored in the Modules page which can be accessed at the Back Office of your Store via the menu Modules>Modules. There you will be able to see a list of the currently installed modules in the “MODULES LIST” section. All the modules are separated in categories which will help you to easily find the modules you need based on the functionality you are searching for. In order to install any module you would like to, first you will need to find the module either in the category related to the module or via the Search box located above the category list. Once you find the module you should simply use the Install button so the module can be installed to your Store. Once the module is installed most probably you will be presented with a configuration screen depending on the module and with that the installation process of the module is finished. Once a module is installed you will most probably come to a point when you need to edit the module and in order to do so PrestaShop 1.6 provides you with the Configure option located next to every module in Modules>Modules. The option will eventually lead you to the configuration page for the concrete module where you will be able to perform further configuration and edits on the module. Another set of options provided by PrestaShop 1.6 when it comes to the module management is the additional menu available right next to the Configure button. By knowing how these options actually work following the explanation above you will be able to easily modify the use of the module and also to delete it if necessary. Congratulations! 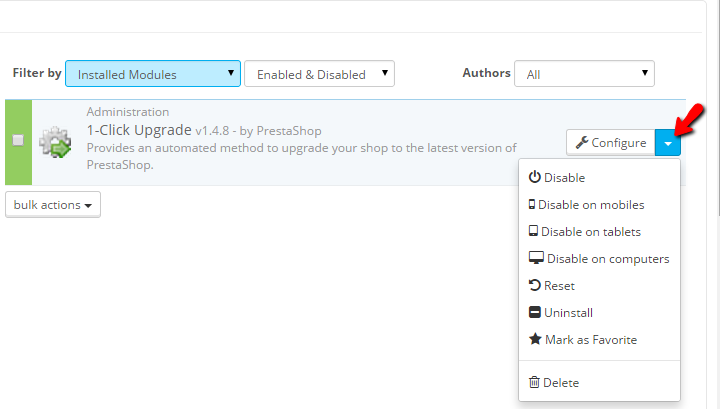 You can now fully manage the module of your PrestaShop 1.6 based website.